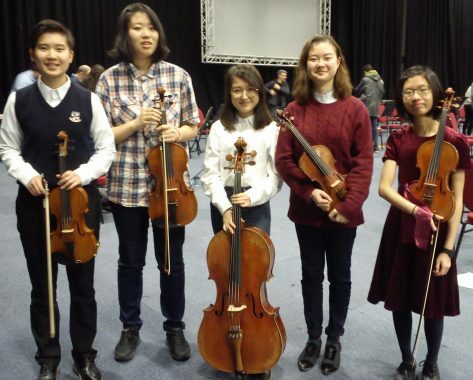 Five students from Ruthin School (Alaina; Eloise; Jamia; Hailey & Zephany) spent Saturday with the BBC National Orchestra of Wales, which has links with the North Wales Youth Orchestra, the National Youth Orchestra of Wales and Bangor University Symphony Orchestra. Lorna Todd, violin teacher at school, arranged for our advanced string players to join the orchestra in this ‘side by side’ concert. We were the only school represented and Zephany was probably the youngest in the orchestra. They spent the morning rehearsing with the orchestra and, in the afternoon, performed Tchaikovsky’s 5th Symphony at Venue Cymru, Llandudno.